After learning that a powerful and ancient enemy is planning to steal a doomsday weapon and use it against humanity the adventurers visit a ruined undersea tower belonging to an undead survivor of the cataclysm that destroyed ancient Azlant. In pursuit of the veiled master they believe has infiltrated the tower, the heroes make their way through the submerged ruin, fighting against the tower's magical defences and undead occupants. Can the heroes learn the location of the facility and escape alive to confront the veiled master, or will they end up entombed in the drowned tower? 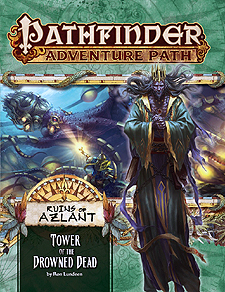 "Tower of the Drowned Dead," a Pathfinder adventure for 13th-level characters, by Ron Lundeen. An exploration of four Azlanti ruins in the Inner Sea region, by Isabelle Lee. A bestiary of new aquatic monsters, by Nathan King, Ron Lundeen, Kalervo Oikarinen, and David Schwartz.